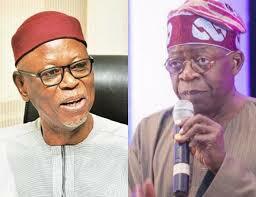 A leading member of the All Progressives Congress, APC, chief Sam Nkire, has warned the party Chairman, John Odigie-Oyegun, and its National Leader, Asiwaju Bola Tinubu, against washing the party’s dirty linen in public. Chief Nkire gave the advice yesterday when he addressed reporters in Abuja, calling on the party’s leaders; especially the two bigwigs whose disagreement had been made public, to perish the idea of taking issues to the press. He went further to note that party administration was not a task for a select few or sole administrators but that it was a team work which involved more public participation than what was available in some of the world’s largest public-quoted companies. Nkire added that the main reason why party administrations were set up was solely for solving problems within and outside the party.